Bugs are ubiquitous here. Most often you see them driving down the cobblestone streets in the historic center of town or along the highway, packed with family members. I’ve seen eight people in a VW bug, five kids in the back seat, the driver behind the wheel, and his wife with a baby on her lap next to him. These bugs have been around a long time. Some are shiny with aluminum wheels. Others are rusted out, spitting smoke, and you wonder whether they have enough oomph left to get moving when the light turns green. 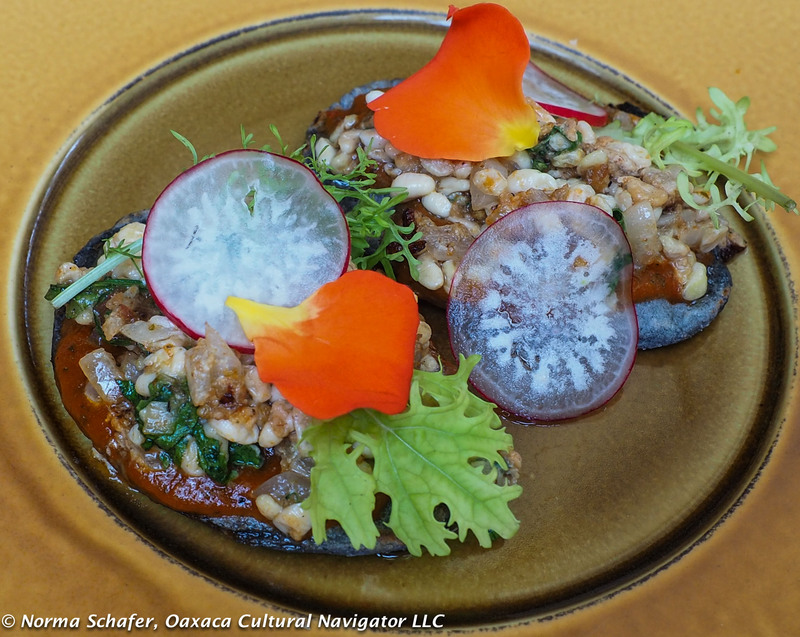 Do you see the escamoles hidden under lettuce and radishes? But, these are not the bugs I’m talking about here. I want to focus on the edible kind: ants, grasshoppers, worms, beetles, larvae and grubs. Now, I hear you. Most of you are saying eeewww or ugh. If you are a visitor or expat who does not venture beyond the ken, your utterance might be particularly vocal. Don’t stop now! 800 words more. Click Here! 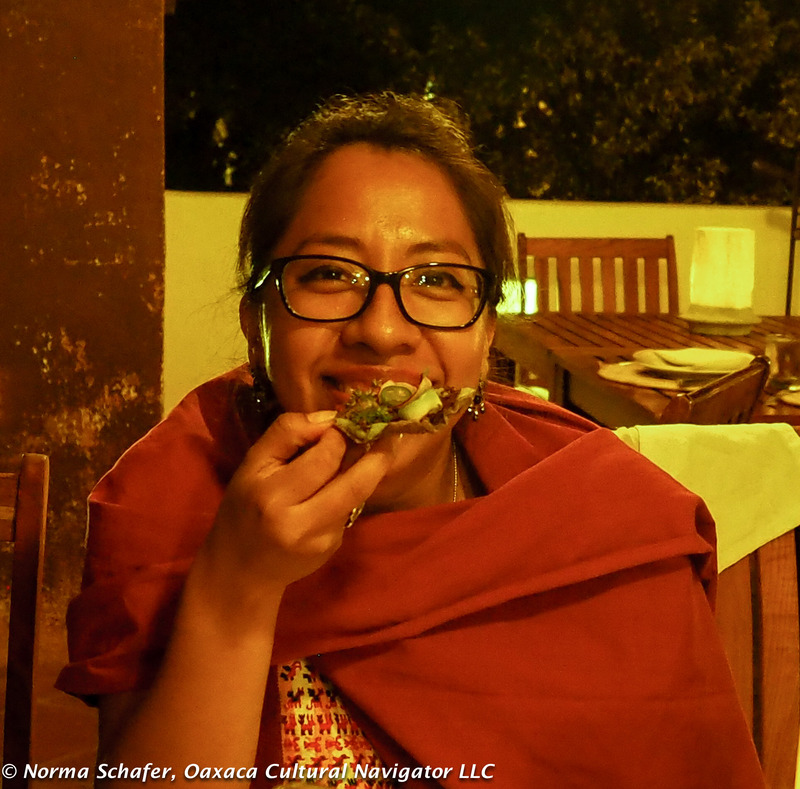 Footnote: I had the idea to write about edible insects in Mexico a couple of months ago, but it wasn’t until our 2017 Women’s Creative Writing and Yoga Retreat that I was truly inspired. 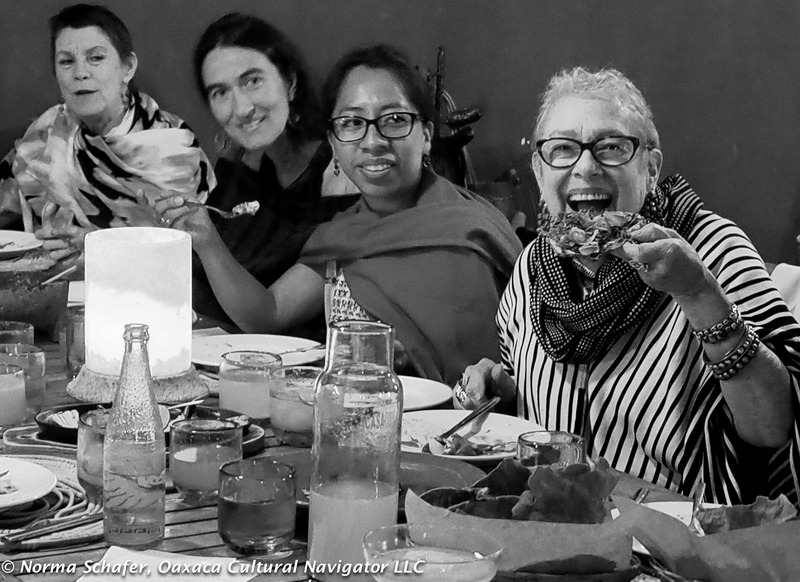 Where else could I find a group of adventurous women, who come to Oaxaca to write, to join me in the conspiracy of eating culturally foreign food? I’m “hamming it up” for the camera. Hmmmm, good. Yes, I ate it. This is a regular part of Janet’s cuisine, just a bit fancified at Casa Oaxaca. One thing I’ve learned, you never know what you are capable of (doing or writing) unless you try. Are you interested in our 2018 Women’s Creative Writing and Yoga Retreat? Send me an email and I’ll put you on the notification list. This entry was posted in Creative Writing, Cultural Commentary, Food & Recipes and tagged ants, bugs, chapulines, chicatanas, creative writing retreat, edible, essay creative non-fiction, food, grasshoppers, gusanos, insects, Mexico, News Daily, Oaxaca, worms. Bookmark the permalink. Norma – did you note the look on Janet’s face while you were eating that UG meal. Still waiting for an answer to my question – why would someone pay more money for a shawl made on a pedalfoot versus back strap loom? I know it takes longer to make the shawl on the pedalfoot .. Are the shawls wider, more detailed or what? If this was mentioned on our tour I have forgotten what the answer was.